The crown princess Samantha fears she’s mad; no one but she sees colors glowing around people. The peasant Robrek Angusstamm believes he’s a demon; animals speak to him, and his healing powers far outstrip those of his village’s priests. Despite their fears, their combined powers make them the goddess’s choice to rule the kingdom of Korthlundia. Samantha’s ability enables her to discern a person’s character through their multi-colored aura, and Robrek’s makes him the strongest healer the kingdom has seen in centuries. But their gifts also endanger their lives. Royals scheme to usurp the throne by marrying or killing Samantha, and priests plot to burn Robrek at the stake. Robrek escapes the priests only to be captured by Samantha’s arch-enemy, Duke Argblutal; Argblutal intends to force the princess to marry him by exploiting Robrek’s powers. To save their own lives and stop the realm from sinking into civil war, Robrek and Samantha must consolidate their powers and unite the people behind them. The Princess Samantha sat at her dressing table and glowered at her reflection as her maids dressed her hair. She detested balls and loathed the hundreds of suitors who flocked around her, spouting empty flattery: “I have never seen a lovelier flower, Your Highness!” or “Your eyes rival the brilliance of the stars, Your Highness!” If I hear that one again, I’ll vomit. It wouldn’t be quite so bad if even one of them meant it. Sometimes she wished . . . . She pushed the thought away. She was the heir to the throne. She couldn’t expect romance. “Let us be painting your face tonight, Your Highness!” Ardra begged, in her north Korthian accent. Samantha’s maid was as small and slight as the princess herself and had hair so blonde it was almost white. “Yes, Your Highness,” Malvina chimed in. “Lady Shela’s maids said just yesterday we couldn’t possibly know our business ’cause you never wear paint.” Malvina, more of a typical Korthlundian woman, was tall and broad and not nearly as pretty as Ardra. Samantha yearned for Danu’s freedom. The long-dead princess was laughing as she galloped across the fields. Danu’s auburn hair flew out behind her in the wind. The stars on the forehead and chest of her horse shone against its gorgeous coat. Samantha loved this painting, which was just as well because it was bolted to the wall and couldn’t be removed without tearing her chambers apart. She’d decorated the rest of her bedroom to match. Tapestries of horses covered the walls. Her dressing table, armoire, and large four-poster bed had horses carved into the woodwork. A quilt, embroidered with horses and stars, was spread over the bed. The mantle over her fireplace sported figurines of horses in gold, silver, jade, crystal, and precious stones. Every new ambassador added to her collection. “So the bards sing of her,” Ardra said. “No, I suppose not,” the princess sighed wistfully, then smiled at the toads that hopped around the feet of Danu’s horse. How I wish my kiss could do that! The Crown Princess Samantha and Sir Robrek struggle to solidify their rule in the aftermath of the king’s murder and Duke Argblutal’s attempt to usurp the throne. They are thwarted at every turn by those who seek power for themselves and desire to prevent their marriage. Just when they think their problems are solved, a deadly curse begins to spread throughout Korthlundia and Samantha becomes pregnant. 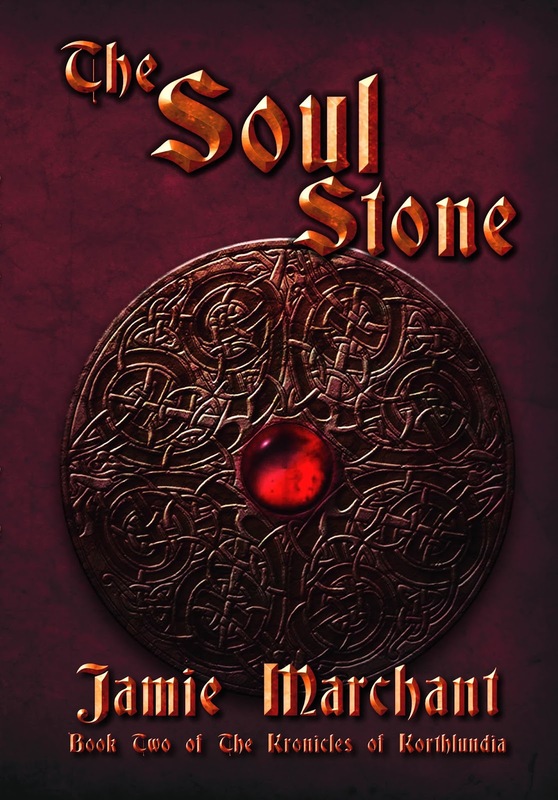 Samantha must fight off priests, enemies, and her closest advisors while Robrek discovers the reason the goddess chose him as king, to defeat the Soul Stone, a stone capable of sucking the soul out of its victims, which threatens to obliterate all life in the joined kingdoms. Their archenemy, the Bard Alvabane, awakens the Soul Stone and plans to use its power to reclaim Korthlundia for her people (a people driven out over a thousand years ago by the hero Armunn). Armunn had to sacrifice his life and soul to contain the Soul Stone. Will Robrek have to do the same? Will the young couple have only a few short months to love each other? At bedtime, Alvabane sat at her dressing table brushing her long hair. It had once been a bright, rich red, but it had dulled with age and was now mostly grey with only a few strands of color to remind her of what once had been. It seemed a metaphor for her life—small flashes of color to remind her of her once bright purpose. One of those flashes, Erick, set her nightly goblet of fortified wine next to her hand. She needed the strong alcohol to dull the pain of her joints so she could sleep. Erick had served her for ten years. When her former servant had died, he’d been sent by her people, despite the fact that she’d only been a disappointment to them. In the mirror, she saw Erick’s eyes narrow. He was not yet twenty and still had the optimism of youth. He still believed the Stone would come to life again when the gods willed it. He believed it would again be the weapon it had once been. Created in the far past by magic which had since been lost, it had been used by her people to protect themselves from the barbarians that now ran free over Korth and Lundia. “I will perform the rites next month,” she promised, but so had she promised last month and the month before that. The stairs to the bottom of the East Tower were agony to her knees. Erick made a mewing sound, reminding her what he’d sacrificed to serve her and the dark gods. She herself had cut his tongue from his mouth when he came to her as a ten-year-old child. He had surrendered it stoically. Only the Bards were allowed to sing the rites of the gods. All others who heard them had to be rendered mute so they couldn’t repeat music not meant for their tongues. The Ghost is going to hell. Not even the goddess can forgive his sins: assassin, oath-breaker, traitor (an affair with the queen earned him that title). No one can ever learn the princess is his daughter. To keep this secret, he flees to the land that turned him from a simple stable groom into an infamous killer. His mission now? To find evildoers and take them to hell with him. But when an impulsive act of heroism saddles him with a damsel who refuses to be distressed, her resilience forces him to questions why he really ran from his daughter. The Ghost knelt at Ares’s feet, where the stench of blood was nearly overpowering. The altar was stained with it, and the bowl at the god’s feet was full from a fresh sacrifice. The power present in this place was undeniable—dark and forbidding, far from the peace and serenity in Sulis’s temples. But he was no longer worthy of Sulis’s blessing. 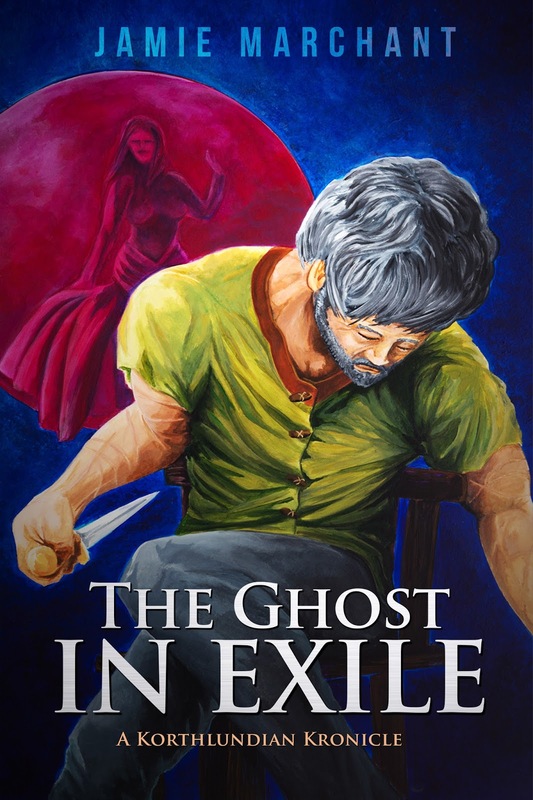 The Ghost drew his dagger, held his left forearm over the sacrificial bowl, and sliced a new cut alongside his numerous scars. As he bled into the bowl, he felt the magic of the place coalesce around him. His blood sizzled as it hit the bowl, and the wound on his arm healed instantly, signaling that The Ghost truly belonged to the Saloynan god. Zotico may not appear to age, but his ghoulishness grew with each passing year. The Ghost carefully schooled his features to avoid betraying any sign of revulsion. “Away.” The Ghost had no intention of ever letting Zotico learn anything about Samantha, who was both his daughter and his queen. Because of his careful disguise, Zotico believed The Ghost was a Saloynan. “You are not my friend.” The Ghost left with Zotico’s laughter ringing in his ears. Jamie began writing stories about the man from Mars when she was six, and she never remembers wanting to be anything other than a writer. Everyone told her she needed a back up plan, so she pursued a Ph.D. in American literature, which she received in 1998. She started teaching writing and literature at Auburn University. One day in the midst of writing a piece of literary criticism, she realized she’d put her true passion on the backburner and neglected her muse. The literary article went in the trash, and she began the book that was to become The Goddess’s Choice, which was published in April 2012. Her other novels include The Soul Stone and The Ghost in Exile. In addition, she has published a novella, Demons in the Big Easy, and a collection of short stories, Blood Cursed and Other Tales of the Fantastic. 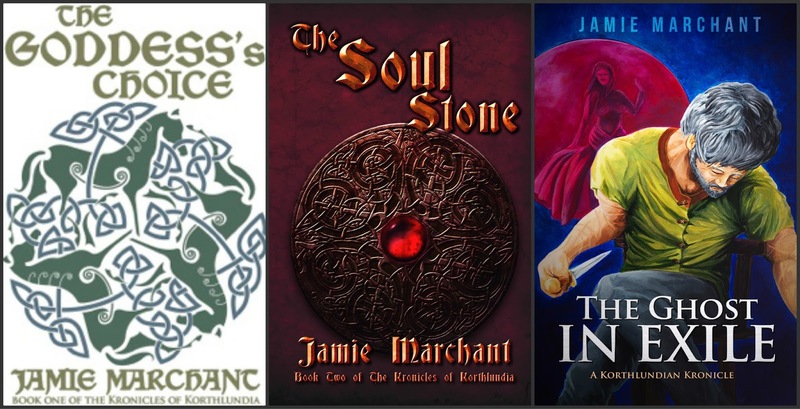 Her short fiction has also appeared in the anthologies--Urban Fantasy and Of Dragons & Magic: Tales of the Lost Worlds—and in Bards & Sages, The World of Myth, A Writer’s Haven, and Short-story.me. She claims she writes about the fantastic . . . and the tortured soul. Her poor characters have hard lives. She lives in Auburn, Alabama, with her husband and four cats, which (or so she’s been told) officially makes her a cat lady. She still teaches writing and literature at Auburn University. She is the mother of a grown son.